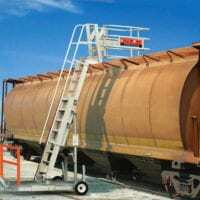 Gangways and cages help workers access the top of tanker trucks and railcars safely. 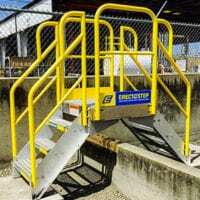 Because operators can easily position the cage over the vehicle hatch, they can load and unload from the safety of the gangway platform — without worrying about slips and falls. But there’s a bad habit that’s developed in the industry. If the vehicle hatch doesn’t quite align with the cage, instead of stopping to move the vehicle (as safety dictates), workers have been raising and repositioning the gangways from atop the vehicle. This means workers are leaving the loading rack and standing directly on the truck surface. No longer protected by the barrier of the safety cage, this extremely dangerous practice has increased the risk of falls, injuries and deaths. So the frac sand and cement industry presented SafeRack with a challenge: Design a solution that forces the operator to use the gangway and safety cage properly. That is, one that doesn’t allow the operator to lift the gangway while standing on the vehicle top. As the first-of-its-kind gangway locking device, SafeLok physically prevents the operator from bypassing the gangway safety system by keeping the gangway securely locked in the down position. Only when the operator returns to the main loading platform can they release the lock to raise the gangway. This prevents the gangway from being moved until workers are safely out of the work area. Set and released with a simple press of the foot, the lock is simple and seamless for anyone to use. This means the lock won’t slow your load rates, keeping all trains running on time. The innovative SafeLok is also easily added on to your existing SafeRack equipment, or it can be included when new equipment is ordered. After several beta versions, SafeRack has met the industry challenge with the robust SafeLok device. By working together with the frac sand and cement industry, SafeRack built a practical safety solution for operators across industries. Easy maneuvering. With the simple press of a foot pedal, you control how your gangway moves. Easily unlock to release the mechanism to move slowly downward or return to the stored position. Heightened level of control. SafeRack’s SafeLok allows for more locked positions on the way up and down, and operators can stop the gangway anywhere in its range of motion. Enhanced safety. Built-in safety mechanisms keep operators from falling into bad habits. Once the gangway is lowered into the working position, it locks into place, preventing the gangway from being raised. Compatibility. SafeLok is available with new gangways from the SafeRack G4 Series — or it can be retrofitted to your existing G4 Series gangways. To learn more about how SafeLok can increase safety at your facility contact a SafeRack representative.